One of the premier robo-advisors, Wealthfront isn’t resting on its laurels. The Wealthfront robo-advisor is innovating to remain one of the most popular automated investment advisors in the fintech universe. 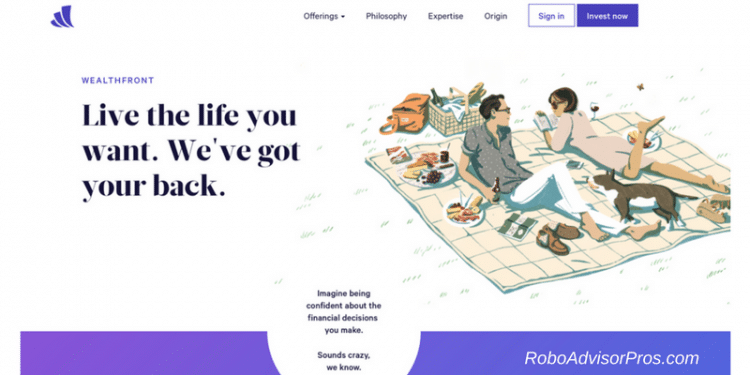 What Differentiates Wealthfront from Betterment and other Robo-Advisors? What are the Wealthfront Investments? What are the Wealthfront Fees? What Accounts Does Wealthfront Support? What is the Wealthfront Risk Parity Fund? Wealthfront is one of the largest robo-advisors or digital investment managers with $15 billion assets under management. Offering low investment management fees, Wealthfront employs state of the art research to craft an efficient, diversified investment portfolio. This means that your investments are managed in a comparable way to a high fee financial advisor, for a fraction of the cost. Wealthfront’s combination of strategies would take an individual investor or investment manager 105 hours to replicate, according to company research. Overview Automated investment management robo-advisor with extra features. Fee Structure 0.25% of AUM. Zero fees for cash account. Top Features Digital financial planner. Daily tax loss harvesting. Hi yield cash account. Loans available. Free Services Free portfolio review. Home buying guide. Contact & Investing Advice Phone for clients & Email 24/7. Investment Funds Low fee, diversified stock & bond ETFs. Accounts Available Joint & individual taxable, Trust, Traditional, Roth & rollover IRAs, Simplified Employee Pension (SEP) IRAs, & 529 College Savings Plan accounts. Promotions First $5,000 managed for free. This 2019 Wealthfront Review, will answer the question – Is Wealthfront worth it, for you? You’ll learn about all the features, and how this robo-advisor, with a digital financial manager, can guide your financial life. How much should I to save? Where to keep my emergency cash? Which accounts to use for various goals? How to craft the best investment strategy? Can I take time off for travel? How to save for my children’s college? At the helm is chief investment officer, Burton Malkiel, PhD, a respected investment researcher. He wrote the classic book, “A Random Walk Down Wall Street,” which spurred the index fund investing revolution. Wealthfront offers many unique features including a free Portfolio Review tool which evaluates your investments across key dimensions that impact future performance. Wealthfront’s daily tax-loss harvesting purports to give investors greater benefits than less frequent tax-loss harvesting. 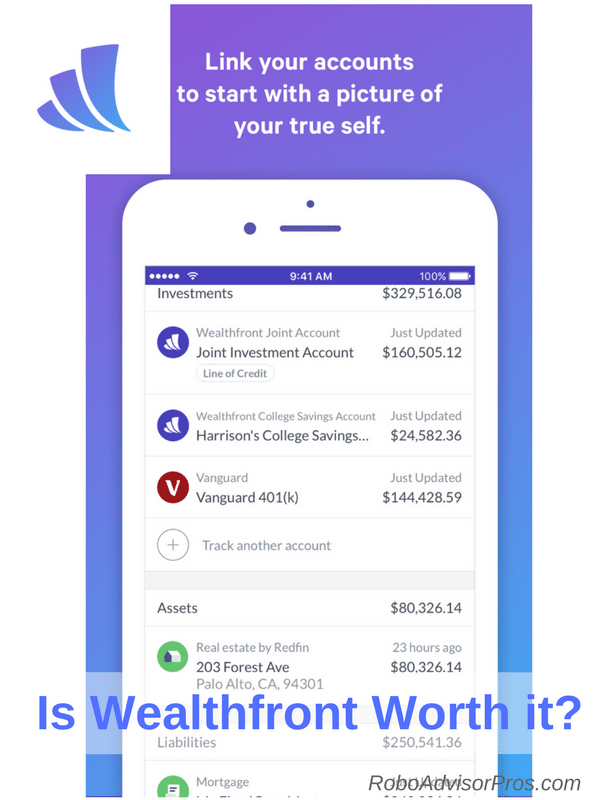 Path, Wealthfront’s digital financial planning experience claims to provide investment advice, on a par with that of a human financial advisor. Other unique features discussed more fully below are Wealthfront’s selling plan, direct investing and a 529 college savings account. Further adding to Wealthfront’s allure is their newly launched cash account, adding banking services to their other investing and planning offerings. Wealthfront’s initial questionnaire is impressive. It’s as if you’re speaking to a real financial advisor, without leaving the house. The Path financial advisor covers all the investment related questions. Ultimately, an investment portfolio should be as personalized as possible and incorporate your situation, risk tolerance, salary, net worth and more. Wealthfront does an excellent job covering the financial planner questions, without talking to a human! Choose your primary investment goal – general savings, retirement, college savings, other. What are you looking for in a financial advisor? Create an investment portfolio, save money on taxes, money management, and to match or beat the market performance. What’s your age, salary and tax bracket? What are your investment objectives – maximize gains, minimize losses, or both equally? If your investment portfolio lost 10% of its value in a month, what would you do? Sell all, sell some, keep all, or buy more. That’s it for the initial, pre-sign up questions! Wealthfront then shows a customized asset allocation investment plan. 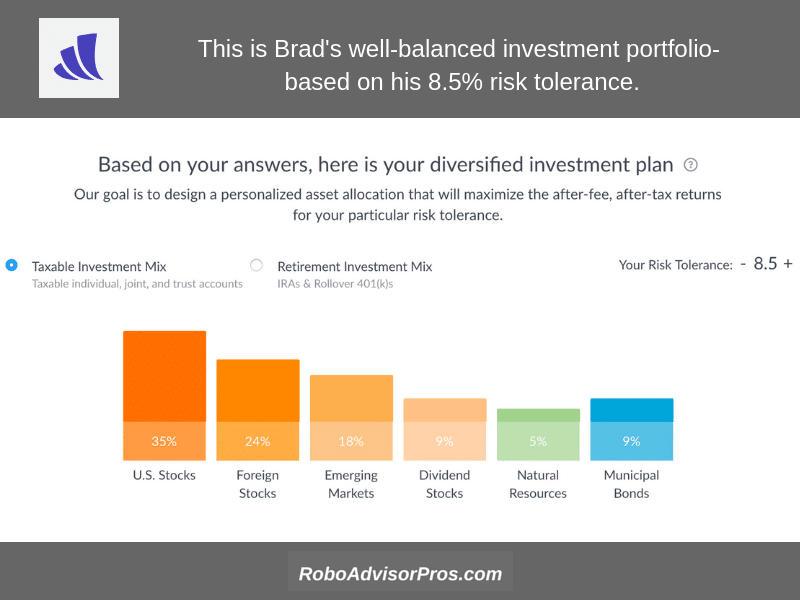 Here’s Brad’s sample asset allocation. Brad is a 34-year-old single guy saving for retirement who sought guidance from the Path digital advisor to maximize gains and minimize losses. Brad has an 8.5 + risk tolerance which is moderately aggressive. After the initial questionnaire, you have an opportunity to answer more questions to receive additional personalized financial advice. The stock funds cover the U.S. and international markets including both developed and emerging markets as well as a dividend appreciation ETF. The bond ETFs span government, treasury inflation protected bonds, U.S. corporate bonds, a foreign emerging markets bond fund and municipal bonds for those with a taxable account in a high tax bracket. The final two sector funds cover the U.S. real estate sector and Energy Select Sector SPDR ETF (XLE), an energy or natural resources fund. The funds are well diversified. The ETF list is current at present and may change in the future as Wealthfront’s research evolves. Your asset allocation will include investments from the above list, in percentages that relate to your asset allocation. If you’re a more conservative investor, you’ll own more bonds and cash investments. If you’re younger or a more aggressive investor, you’ll own a greater percentage of stock funds. We believe that the fund choices are sufficiently diversified with low fund management fees. And if you’d prefer another asset allocation, you can choose a different risk tolerance level, which will change the percentages of stocks vs. bonds. All Wealthfront investment portfolios are regularly rebalanced. Simply, if stocks outperform bonds and the percentage in equities grows above your target, these funds are sold. The underperforming bonds are bought to return to the preferred asset allocation. This reduces risk and may also increase returns. For all investment accounts, the Wealthfront fee is 0.25% annually, of all assets under management, deducted monthly. Wealthfront doesn’t charge an account-opening, withdrawal, account-closing, trading, commission or account transfer fees. There are no fees levied upon the Wealthfront cash account. What is the Wealthfront Account Minimum? The account minimum is $500.00. This entitles you to portfolio management of a diversified investment portfolio with rebalancing and tax-loss harvesting (for taxable accounts). 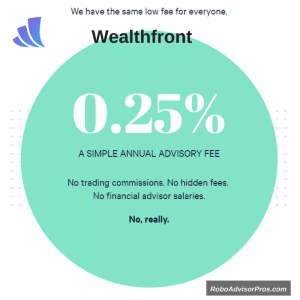 Wealthfront offers among the largest number of available accounts among the robo-advisors. They’ve recently added the college savings 529 account so that parents and grandparents can fund a child’s college education. All Wealthfront taxable accounts are eligible for tax-loss harvesting. This tax-optimization strategy is carried out when one ETF is trading at a loss. Wealthfront sells that fund and replaces it with a similar one which keeps the portfolio asset allocation in line with your original asset mix. This is a unique feature as other robo-advisors require a certain amount of money to take advantage of this tax-loss harvesting. Their ‘daily’ tax-loss harvesting claims to give investors significant savings over less frequent tax-loss harvesting. Following is where Wealthfront offers several unique features. The three tax-optimized direct indexing offerings are supported by their research-based white papers on the topic and suggest that these plans will reduce taxes and increase returns. The detailed explanations are helpful for the most sophisticated investors and can be found in the research section of the Wealthfront site. Option 1– For accounts valued between $100,000 and $500,000. Replace the Vanguard Total Stock Market ETF (VTI) with up to 100 large cap stocks from the S&P 500 plus a sample from the Vanguard Extended Market ETF (VXF) and Vanguard S&P 500 ETF (VOO). This option is called the Wealthfront 100 or WF100. Option 2 – For accounts between $500,000 and $1 million. Replace stocks from the S&P 500 index and the Vanguard Extended Market ETF (VXF) with up to 500 representative individual stocks. This option is called the Wealthfront 500 or WF500. Option 3 – For accounts valued at more than $1 million. Replace the Vanguard Total Stock Market ETF large cap and mid-cap stocks as well as stocks from the Vanguard Small-Cap ETF (VB) with up to 1,000 similar individual stocks. The stocks in this option are called the Wealthfront 1000 or WF 1000. This gives Wealthfront the opportunity to sell individual under performing stocks allowing investors to reduce taxable income in an attempt to improve the overall portfolio returns. For investors with an over-weighting in company stock, the Wealthfront Selling Plan helps obtain a more balanced portfolio. It’s ideal for company employees with a great number of corporate stock shares. The single stock selling program applies to all public companies. With the Selling Plan, Wealthfront sells your company stock tax-efficiently and commission-free. Instead of selling all your shares at once, the tailored transfer process migrates your investments tax-efficiently into your diversified Wealthfront portfolio. Wealthfront recently launched College Planning with Path. This feature helps navigate the complete college planning process. You select a college to see the total cost picture for the school, including room, board, tuition and expenses. Path calculates the financial aid your student can expect from the specific school. With the Wealthfront 529 account, you’ll find out how much your savings will grow and the amount of the expenses your account will cover. Risk Parity is an optional investing strategy for accounts worth more than $100,000 that attempts to boost risk adjusted returns in a variety of market conditions. There’s been quite a bit of press about the Wealthfront Risk Parity Fund. Since it’s an optional service, you can follow the discussion to determine whether it’s appropriate for you or not. Whether you use a robo-advisor or not, you must sign up for the FREE money management dashboard and reports below. I use it myself! Also called Advanced Indexing, Smart Beta is another feature for investors with more than $500,000 invested in a taxable account. This investment strategy adjusts a taxable portfolios asset allocation based on other factors than the typical market capitalization percentage. Smart beta considers factors such as investment momentum, value, dividend yield, market beta and volatility. If you’re interested in this investment strategy but haven’t yet reached $500,000, Betterment also offers smart beta investing. If you have an expense, like a vacation or wedding, and don’t want to sell investments, to free up cash, Wealthfront offers a portfolio line of credit. The loan is available quickly and with a low interest rate. For ready cash and an emergency fund, the Wealthfront Cash Account offers a zero fee, high yield account. The minimum deposit amount is one dollar and the value of your account is secure with up to $1 million FDIC insurance and unlimited transfers. The current interest payment on the cash account is 2.24%, a significantly higher rate than the average bank savings account interest rate. It’s clear that Wealthfront has a lot to offer the investor. 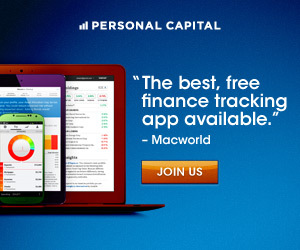 Their features are equal to or better than the typical robo-advisor. The Wealthfront management fee is low at 0.25% of AUM after the initial, always free, first $5,000 and the minimum $500 entrance fee is reasonable. Although, M1 Finance requires only $100 to get started and doesn’t have any management fees. The tax-loss harvesting offerings is a draw and daily TLH might improve performance for taxable accounts. Loans for existing customers who have cash needs but don’t want to sell their current investments can come in handy for unexpected expenses. Personally, I prefer using the cash account to save up a substantial account which can be deployed for sudden or planned short-term cash needs. The single stock selling plan is unique and a niche product for investors with a large amount of company shares. The foreign-emerging market bond ETF (EMB) is an excellent diversification element giving investors a chance to dip their toe in to the foreign bond world, which is less correlated with other assets in the Wealthfront offerings. When you transfer in your funds, Wealthfront helps minimize capital gains taxes as your existing assets are sold. For new investors or those with small portfolios, this is a benefit. The Path financial planning tool is a confidence-builder when you need to understand if you’re ‘on track’ for retirement. 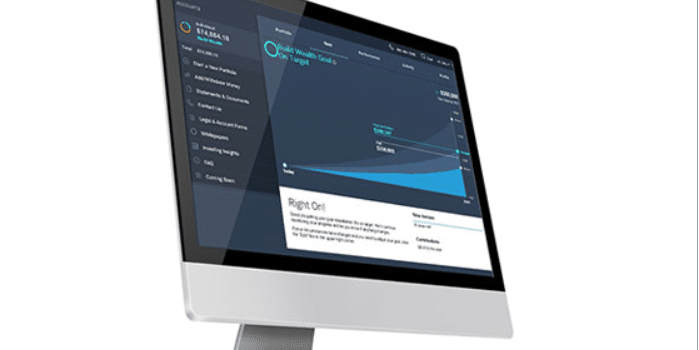 The high yield cash account is a strong sell, and only available at a handful of robo-advisors, including Betterment. One size fits all doesn’t fit everyone. The lack of someone to consult with may be a drawback for some investors. With Betterment offering both human financial advisor access and a la carte financial planning packages, Wealthfront lags in this area. It’s unclear why the energy ETF (XLE) is labeled a natural-resources fund and not an energy fund. There are questions about why XLE was selected over other sector funds or why it is needed at all. Wealthfront omits small cap and value ETFs from their lineup. These asset classes have long term evidence of outperforming the overall investment markets. Wealthfront has grown to manage over $16 billion as of Winter 2019. They offer transparency, tax-sensitive investing and the PassivePlus® investing approach all for a low fee. For new investors, it’s an excellent choice. For those with larger portfolios, the tax-optimized direct indexing is a compelling feature. Is Wealthfront worth it? Yes, Wealthfront is worth it with it’s host of differentiated features at a low fee. It’s good for those investors looking for a middle point between a DIY approach and a full-fledged financial advisor. For the wealthy users, it’s important to round out your Wealthfront investment account with a tax professional and estate planning attorney. Although, if you want a comparable product with human financial advisor access, you might examine the Betterment Review. Click here for direct access to the Wealthfront Website.